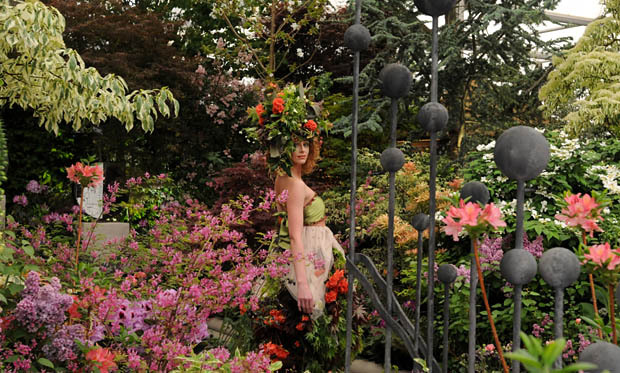 There was much to celebrate at the 2014 Chelsea Flower Show by exhibitors in Hampshire but 2015 was another fantastic year with show gardens, floral marquee displays and trade stands. Designed by the 2014 BBC/RHS Chelsea People’s Choice winner Matthew Keightley, this garden celebrates the opening of the Mamohato Children’s centre in Lesotho, South Africa. Keightley has designed the garden to aims to raise awareness of Sentebale’s work in providing healthcare and education to Lesotho’s most vulnerable children, many of whom are victims of extreme poverty and Lesotho’s HIV/AIDs epidemic. The garden will give visitors a taste of Lesotho and the bright, vibrant atmosphere of the Mamohato camp and will include a rock and waterscape feature which is representative of the mountainous region in this part of South Africa. Working with local partners to deliver care, health and education in Lesotho Sentebale is a charity founded by Prince Harry and Prince Seeiso of Lesotho with the priority to reach Lesotho’s most needy and vulnerable children, many of whom are the victims of extreme poverty as well as Lesotho’s HIV/AIDs epidemic. The Prince of Wales’ Foundation for Building Community has advised Sentebale in the design of the Mamohato Children’s Centre using their expertise in delivering a sustainable development that allows for a marked improvement in quality of life. In this case, the lives of thousands of young people who have been stigmatised by loss of one or both parents, who live with disabilities and those trying to come to terms with living with HIV. The Garden also surrounds a building, constructed using traditional materials and methods, which represents the entrance building to Mamohato Children’s centre, offering further shelter and security to the vulnerable children Sentebale helps. Matthew Keightley (30) began his landscape design career at the age of 17. His international experience includes garden consultations and designs in Paris and Cairo, as well as Perth, Australia. From the modern, urban spaces of Chelsea and Kensington in London, to the expansive, traditional and Kent countryside and Henley-on-Thames riverbanks. This is his second Show Garden at RHS Chelsea and the second time he has scooped the People’s Choice award. Harry and David Rich have designed the Cloudy Bay Garden to reflect the tasting notes and characteristics of two of Cloudy Bay’s popular wines. Using this as the basic concept, planting and flower colours, perfumes and textures are used to visualise the flavours experienced when drinking the wine. It is also a garden in which to enjoy wine, taking you from the fresh and clean tones of a Sauvignon Blanc with planting in red, purples and plums to the floral, dark and earthy tones of a Pinot Noir with light white and green planting. A moveable shack in the centre of the garden reflects the vineyard’s heritage, giving different perspectives of the garden, whatever the weather. Another aspect of the garden is water features portraying the clean crisp character of the white Sauvignon Blanc, together with oak reflecting the old wooden wine casks. Marking the 200th anniversary of Wellington’s victory at the Battle of Waterloo and Wellington’s College’s role as his living legacy, this garden will be replanted at the college. The garden progresses from the bleakness and brutality of the Battle of Waterloo 200 years ago, through the greening and flowering of the landscape towards an a representation of the iconic architecture of Wellington College, the memorial to the Duke of Wellington. The garden’s design reconciles the drama and violence of the battle with a progressive and positive future. Elements of the garden are inspired by the landscape and terrain of Waterloo which Wellington used to his advantage, the battle formations that successfully repelled attack, the regimental colours of British and Allied troops, the eight aptitudes central to the teaching of the College and the materiality of the College itself, marked with the personal carvings of current pupils and alumni. 2015 sees the 200th anniversary of the Battle of Waterloo, a victory that changed the face of Europe and propelled Arthur Wellesley, the 1st Duke of Wellington, to hero status at home and on the Continent. Wellington College was set up as a national memorial to him after his death, initially to provide an education for orphans of fallen soldiers. For the fifth year in a row, Royal Bank of Canada returns to RHS Chelsea Flower Show, this time with a contemporary garden from Matthew Wilson which explores living sustainably through good design and understanding the importance of conserving fresh water in growing plants for pleasure and as food. The garden is divided into three main parts; a zero irrigation ‘dry garden’, central water harvesting/storage zone, and edible garden, with a raised seating and dining platform. The garden is divided into three main parts; a zero irrigation ‘dry garden’, central water harvesting/storage zone, and edible garden, with a raised seating and dining platform. The garden designed to be easy to live with, one that can be a little ragged around the edges without detracting from its beauty, and a garden that provides edible plants alongside ornamental plants in a fun, easy to manage way. Matthew’s work on creating the Dry Garden at RHS Garden Hyde Hall and the RBC Blue Water Project has been the inspiration for his garden. Based around a series of curved beds and features the garden represents the ebb and flow of water, creating a sheltered sunlit space. Drought tolerant and sun loving trees, shrubs and flowers form the planting for the garden which also has a small pond. The Royal Bank of Canada Garden will be relocated as a community garden after the show. The Haven is a national charity that provides free, tailored, emotional and physical support to people affected by breast cancer. A place of retreat and recovery and developed on the concept of ‘the nest’, the garden is an embracing and peaceful environment that is uplifting and reassuring. The garden is a true crafted Artisan garden with a Designer and Artisan Sculptor working together, creating a space focused on relaxation and emotional support. The theme is based on the oak tree as a symbol of strength and longevity and contains a willow woven lounger inspired by the oak leaf sited in a woodland edge setting and nestled under a ‘quirky’ Quercus (oak tree). It can accommodate 1 person stretched out or a group of 2-3 friends sitting. A place to be on your own (if desired) but not alone. The Garden will contain a statement oak tree with woodland edge. The Garden will consist of mainly earthy colours and natural materials, oak and willow will be used. Sculptures, by artist Tom Hare, will include a woven willow lounger and acorn sculptures which also contain lights use after dark. Whitchurch-based Sarah Eberle has previously won 9 RHS Gold medals, including Best in Show at both Chelsea and Hampton Court Palace Flower Shows. The garden will be relocated to the new Haven Centre in Hampshire. Sarah Eberle also won a Gold in the Fresh Garden category with Beyond Our Borders (Fresh Garden 3). It is a conceptual one for the Animal And Plant Health Agency and illustrates the threat of global plant pests and diseases to our native species. The garden celebrates a “sentinel tree” project, in which British trees are planted in other countries to see how they are affected by potential invaders. The garden is split into three zones by water features that signify the oceans. Set within the planting are slinky toys, representing the ability of pests and diseases to move from zone to zone, reflecting the threat to plant health. As the slinkies progress towards the water trays they morph into pulsing lights that travel through the water, demonstrating risk pathways via global plant trade. Hillier opted not to release new introductions, but instead to shine a spotlight on the reliable, favourite plants from every corner of the world that come together to make up a British Garden. Every year, the Hillier exhibit at the heart of The Great Pavilion thrills visitors with a display of 4,000 plants, from small alpines to magnificent large trees. Most are established favourites, which Ricky Dorlay (celebrating his 50th Chelsea) and his team know will perform at the right time and stay looking good for the duration of the show. “The performance of a show plant at Chelsea is a good indication of its durability in the garden,” says Andy McIndoe, Hillier’s Managing Director, who is designing and staging the Hillier exhibit at Chelsea for a 25th consecutive year. “If it stays in good condition during preparation, transport to London, staging and for the week of the show, whatever the weather, it will stand up to most things in a garden”. Physocarpus opulifolius ‘Diable d’Or’ is a good example. This wonderful foliage shrub with arching branches and red-brown leaves, copper at the tips of the shoots, stays beautiful from spring to autumn. Clusters of pinkish flowers are secondary but they do develop into jewel-like clusters of fruits all along the branches in late summer. The rich, warm tones of the foliage make it a wonderful planting partner for just about any colour, especially apricot, orange and flame. “We love to use it with the rich apricot Rhododendron ‘Firelight’ or Rhododendron ‘Mrs T.H. Lowinsky’ whose pastel blooms have a copper flare in the throat. Phormiums, with their bold architectural forms and exotic colours are valuable additions to the planting palette. Contrasting with the soft round forms of many familiar garden plants they provide accent and contrast in mixed plantings and as specimens in pots. They lend themselves to colour-themed foliage planting and have become essentials in the Hillier Chelsea exhibit in the past 20 years. “I don’t remember using phormiums in my first few Chelseas,” says Andy, “but now I just wouldn’t be without them. Phormium cookianum ‘Tricolor’ is a magnificent plant with bold arching leaves of green, striped cream and red. It is tougher and hardier than other varieties. midwinter, and we think we can rely on it to bloom for us at Chelsea. Fatsia japonica may not be the showiest or most colourful plant in the Hillier display. However its big, green and glossy leaves are so useful in shade under specimen trees and shrubs. It can create an exotic effect in a planting scheme and is an excellent subject for a pot in shade. As gardens get smaller, and shady situations become a frequent challenge, shade lovers like fatsia are invaluable, especially when they look so good throughout the year. The common elder is best known for its flattened heads of creamy white flowers and loose clusters or red-black berries. In recent years various purple-leaved varieties have become essential foliage shrubs in our gardens. They grow quickly, thrive on most soils, especially chalk and clay, and provide lasting foliage contract from spring through to autumn. The flowers and fruits make them popular wildlife-friendly subjects providing nectar for insects in early summer and fruit for birds in autumn. Sambucus nigra ‘Blue Sheen’ is a Hillier selection with deep purple black foliage with a distinctive metallic blue sheen to the leaves. Hardy’s have also grown plants for Adam Frost (The Homebase Urban Retreat Garden, in partnership with Macmillan Cancer Support (show garden at MA18) – Gold), Alan Gardner (The Viking Ocean Cruises Show Garden (show garden at MA7) – silver) and Serena Freemantle (Future Climate Info, A Trugmaker’s Garden – Gold (artisan garden at SEW1)). Sparsholt College also won Gold for Wadworth the Hop Cycle (GPJ2) (see Sparsholt College launches garden for Chelsea Flower Show 2015). The different cultivars of hop, Humulus lupulus, have provided flavourings and aromas for beer over the centuries. The display tells the story of the hop, its uses and properties. It features two garden areas – plants that make or flavour alcoholic drinks, and a pub garden celebrating Wadworth’s 140 years of brewing in Devizes, Wiltshire. Hardy’s Cottage Garden plants launched two new plants. Antirrhinum Pretty in Pink (‘Pmoore07’). A perennial form with good rust resistance, re-blooming continually throughout the summer. Rehmannia Walberton’s Magic Dragon (‘Walremadra’). A Chinese foxglove flowering from May until the first frost. Good in sun or part shade it is also attractive to bees.